These are my favorite boots, my favorite color, my favorite. I don’t wear them much, and when I do they are tucked away under jeans. I don’t let the world in on my secret. I am a conservative, God-fearing, introvert, wearing orange boots. Some people gallivant in their bright clothes and flashy plastic accessories, and they are not secretive. They have nothing surprising or remarkable to reveal. That is what they do, they are, they want to be. I am surprising. The world says that I am just a church-goer, a housewife all too fond of her husband, boring. I say, “You have no idea...", while I strut, undetected, in my boots. Their very nature is unpredictable. My sweetie knows that when I have my boots on I might be a little bit sassy or a little bit homesick. He does know to put on his seat belt. What the world doesn’t know about me is a lot, me and my orange boots. For more Caffeinated Randomness, go over to Andrea, at Under Grace and Over Coffee, every Friday! I too don't often show my sassy side through my clothing...but everyone in a while I do wear my sassy shoes. There is something good about knowing I am wearing my sassy shoes...even though no one else would really notice. I love that you are surprising! Oh my! I love this! 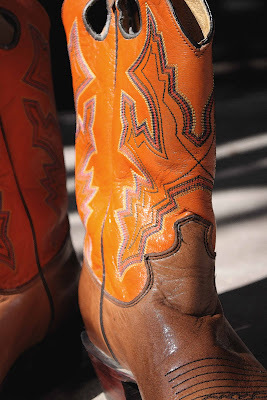 Have a great "orange boots" weekend! I love your boots, and all that they mean. As Christian women we are not boring, the world just isn't allowed to see all we are! Have a blessed weekend! You are so funny! :) Hope you have a fab weekend! Secretly Sassy is good. Way good. Just ask my husband! There is nothing better than a pair of sassy boots. I will admit mine don't look like that ;) but I do have a pair! Those are some great boots!!! And what a great blog you have. Love the boots, Tracy! And your blog! What a sassy girl you are! Fun! I am going to get me orange boots. I knew we had lots in common. I'm right there with you on the introversion! Loved this post and your orange boots are the BEST! L-O-V-E them! I finally purchased my first pair of cowboy boots a few weeks ago and have yet to wear them. I went the cheaper route this time, only $60, because I am not sure I'm able to pull such coolness off. We shall see what happens! I would LOVE some black and red ones! You may have inspired me! I have things like that, too, and I must say, it's quite enjoyable for us introverts who are called "lame". We are so not. As I sit here in my Duran Duran shirt, I am amazed that I could love you more than I already did...and all over some orange boots!